On 12 February, Prime Minister Theresa May and Irish Taoiseach (prime minister) Leo Varadkar, flew to Belfast to supposedly clinch a deal between Sinn Fein and the Democratic Unionist Party (DUP) that would see the power-sharing executive at Stormont restored after it collapsed in acrimony 13 months ago. Chile: What is the Frente Amplio and what does it represent? 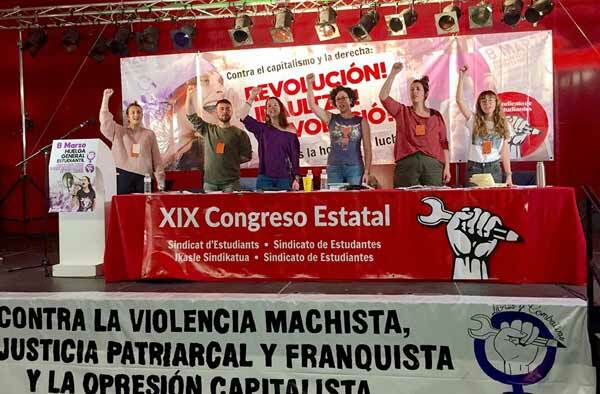 Here we publish an article by Celso Calfullan, from Socialismo Revolucionario (CWI in Chile) on the development of the Frente Amplio (FA - Broad Front), a new Left formation which saw an explosive growth in the 2017 parliamentary elections, and in which CWI comrades have participated from the beginning. As we publish this, walkouts have been held in schools across the country in solidarity with students in Parkland, Florida. Hundreds of high school students walked out, marched, and rallied in Florida, Maryland, Arizona, Illinois, Kentucky, and Minnesota with many more preparing for walkouts in the coming weeks. Zahid Baloch is a political refugee and torture victim from Baluchistan and a member of Rättvisepartiet Socialisterna (CWI Sweden). He was arrested at an "internal border inspection" in Gothenburg on Thursday, 15 February. Britain: Socialist elected President of Usdaw union! Tesco worker and Socialist Party member Amy Murphy has been elected president of the shop workers' union Usdaw.